The Sainsbury Management Fellows Hard Hat Index shows a 19.6% tumble in the use of hard hats as the symbol of engineers in engineering articles - the first fall in four years. Hard Hats dominate the image of engineers says the SMF Hard Hat Index which has tracked such images in 17 engineering magazines for five years. In that time 1,181 images of hard-hatted engineers have appeared in advertisements and articles. Images that SMF believes damages the image of engineering by reinforcing stereotypes and giving a very narrow view of the profession. In the Index’s launch year (2013), there were just 67 hard hats in articles in the monitored publications, but this figure climbed every year until now. The 2017 Hat Index recorded 127 hard hats in engineering articles compared to 158 last year. After years of seeing the figures yo-yo infinitesimally, there is a breakthrough as engineering magazines have started to use more imaginative visuals to communicate more thoughtful images of engineering. But the images used in articles is only half the story. The opposite has happened to the number of hard hats used in advertising. This has soared by over 30%, from 99 hard hat images in the 2016 Index to 129 in the current Index. This is the largest number of hard hats used in advertisements since the launch of the Hard Hat Index. SMF President, David Falzani MBE said,“The hike in advertising images could be due to an increase in the volume of ads; our Index currently doesn't track this information, but will in the future. "Another interpretation of the big difference between the editorial and advertising use of hard hats might be that publishers are embracing the idea of promoting more diversified images of engineers, whereas they do not have input into advertising content; companies control their advertising messages. While it is important to applaud the reduction of hard hats in articles, the advertising figure tips the scale in the wrong direction. The combined figures show that 256 hard hats appeared in the magazines monitored. Just one hard hat image less than the 2016 Index. In SMF workshops with engineering undergraduates, there was a consensus that advertisers should stop using hard hats and other stereotypical images and replace them with inspirational photos that tell better stories about the opportunities in engineering. Hard hat images influence people's view of engineers. Use of the term ‘hard hat’ rose rapidly between 1960 and 2000 (source: Google’s N-gram) probably due to a focus on health and safety. According to SMF, while hard hats are essential in some industries, their relentless use to portray all engineers is misleading. When the SMF YouGov survey asked 2,000 people what items they thought engineers primarily wear on an average working day, the hard hat came top with 63% of the votes, whereas a business suit received 25% of votes. Asked where engineers predominantly work, building and construction sites come top (69% of votes), followed by industrial sites (66% of votes), while offices came fifth. Most people picture engineers working on building, industrial or manufacturing sites, yet the reality is that many thousands of engineers also work in other locations such as offices. The image portrayed influences people’s thinking so ridding the media of the ubiquitous hard hat will help to change perceptions. 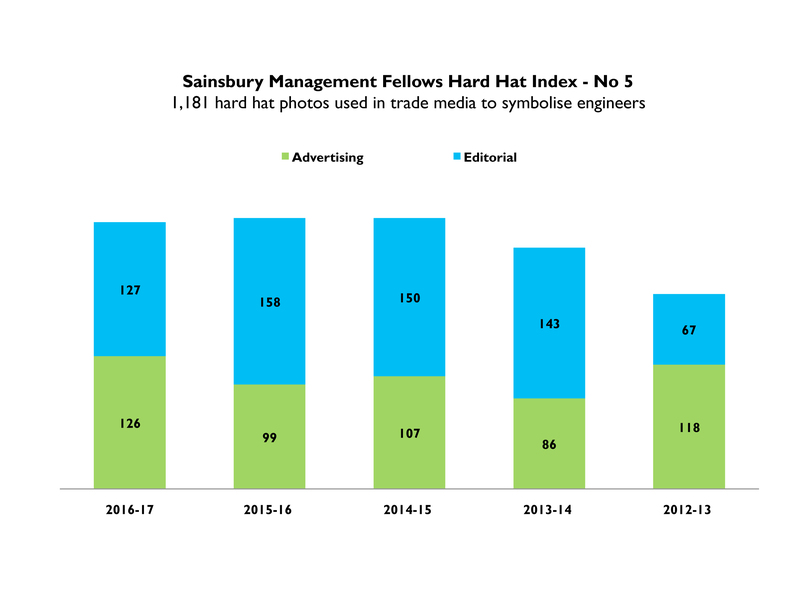 The Sainsbury Management Fellows Hard Hat Index monitors the number of hard hats featured in 17 engineering publications over a 12 month period (April to May). The aim is to highlight the one-dimensional image portrayed of engineers and to encourage the engineering sector to take a critical look at the way it represents itself and make a change.